Show someone some LOVE with this GIANT 63” (5 ft. 3 in.) RED Teddy Bear Stuffed Plush Toy from Joyfay®. Joyfay® teddy bears feature high-quality materials, superior craftsmanship, and enticing good looks and this new GIANT 63” (5 ft. 3 in.) 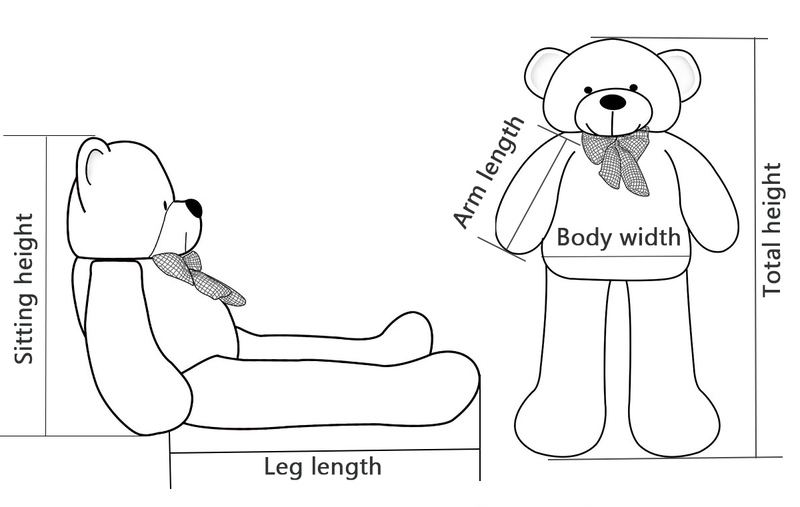 RED Teddy Bear Stuffed Plush Toy from Joyfay® is no different. This vibrant red 63 inch teddy bear is stuffed with soft material and has a fur like plush body. It is great for taking family pictures or portraits, birthdays, holidays, baby showers, or just because. The arms and legs move freely and can positioned anyway you like. So if you’re looking for a great gift or you’re a collector then this GIANT BEAR is for you. This teddy features brilliant RED fur, dark brown eyes, a big round black nose, and is finished with an adorable bowtie. Make this gentle giant a member of your family today. Shipping-Domestically and Internationally: Your order will usually arrive within 2-7 business days from one of our warehouses in the US and China. Other options include shipping internationally and expedited shipping so you never miss another special occasion. Email tracking is also included.